I’ve been on a lipstick kick for days now. The wicked little cosmetic can end a marriage. 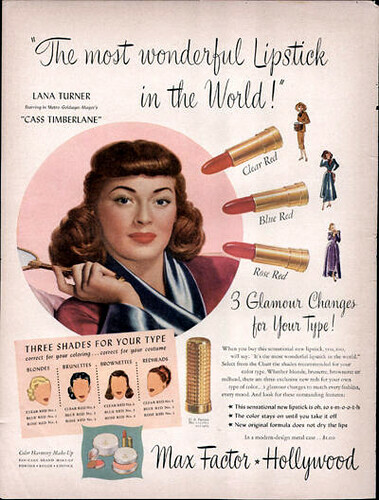 A tube of lipstick can bring about the meeting of two people who ultimately commit murder (as in the classic film noir “The Postman Always Rings Twice”). With lipstick so much on my mind, how could I have forgotten this gem of a song performed in 1959 by Connie Francis? Lipstick on your collar – gonna tell on you. I admit it – I’ve become obsessed over the past few days with the part that lipstick has played in divorce court. 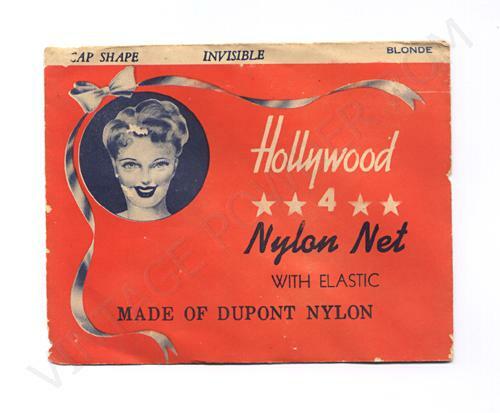 A casual search of the historic Los Angeles Times unearthed about a dozen cases of divorce in which lipstick had a role. I’ve covered two of them already this week. What I can’t figure out is if the men who came home to their wives smelling like a distillery and smeared with lipstick were simply clueless or if they wanted to be caught. 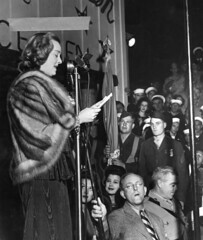 In 1935, the Le Roy Millers were a young couple married only eight months. 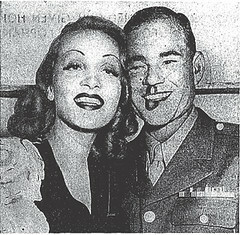 Le Roy was a salesman who, according to his actress wife Dorothy, stayed out all night at least three times each week. Le Roy would come home with a lipstick stained collar and then clam up. He would refuse to divulge his whereabouts during the missing hours, and he became downright surly whenever Dorothy quizzed him. Dorothy couldn’t rid herself of the lurid mind picture of Le Roy and some unknown cutie getting up close and personal. Dorothy finally became so fed up with her husband’s antics that she headed for divorce court. 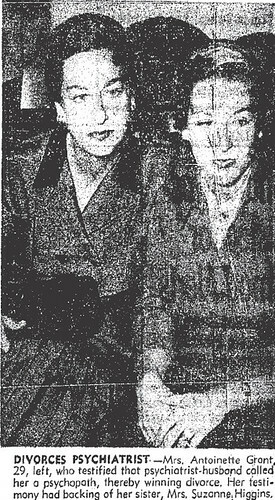 She was accompanied by her friend, Eve Chutuk, who corroborated her testimony. Dorothy was granted a divorce. 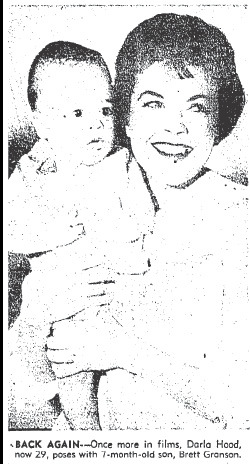 In 1955 Antoinette B. 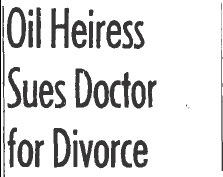 Grant, 29, a Dutch oil heiress filed suit against her psychiatrist husband Dr. Henry J. Grant, 42. Mrs. Grant observed that she couldn’t believe that all of the lipstick marks on his clothing had come from grateful patients. She went on to say that ever since she’d started to voice her suspicions of Henry’s infidelity he had started accusing her of being mentally unstable. Personally, I think that Henry must have been a fan of the 1944 film “Gaslight”. In that movie Gregory (Charles Boyer) attempted to drive his wife Paula (Ingrid Bergman) mad. It didn’t work in the movie, and it wouldn’t work for Dr. Grant either. In a vote of no confidence Antoinette consulted another psychiatrist who told her that she was fine, except for the stress caused by her failing marriage. By September of 1955 the Grant’s divorce proceedings had heated up. 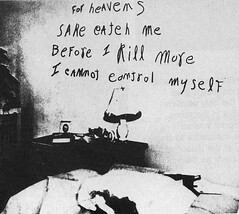 Antoinette testified that her husband frequently called her a psychopath. According to Antoinette many of the couple’s quarrels were over money. 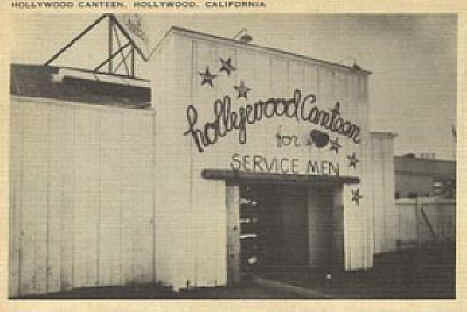 Even though their combined incomes were more than $1000 a month, Henry permitted her a weekly allowance of only $70. With that measly sum she was supposed to run the household, including the wages of a twice-a-week maid. Henry responded to his wife’s pleas for more money by calling her irresponsible and then beating her. When Antoinette couldn’t, or wouldn’t, iron one of Henry’s shirts on demand he crushed a lit cigarette out on her neck. Hmm. Sounds to me like Henry was the crazy one in the family. Physician, heal thyself! Ultimately, Antoinette walked away with the house in Bel Air, a car, $70 a month in child support, and retained a trust fund which would pay her $6,000 per year. 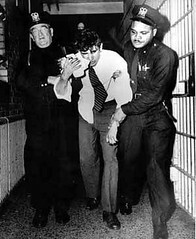 As far as I’m concerned, Henry did much better than he deserved to – he got $16,000 in cash and a car. Another marriage destroyed by that evil home wrecker, liptstick! Lipstick Causes Divorce — Again! 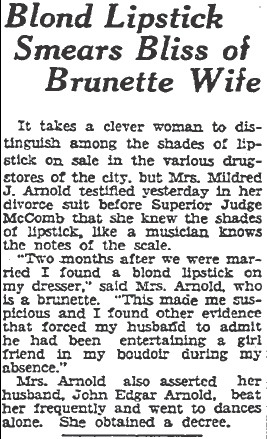 In the previous story from 1930, Mrs. Mildred J. Arnold discovered her husband’s infidelity by recognizing that a lipstick on her dressing table wasn’t her shade. Twenty-seven years later lipstick traces were again the cause of a divorce. 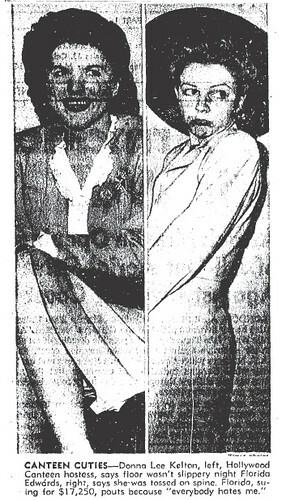 This time the woman was twenty-five year old Darla Hood (of “Our Gang” fame). If you’ve never seen any of the Our Gang shorts, shame on you — they are wonderful. 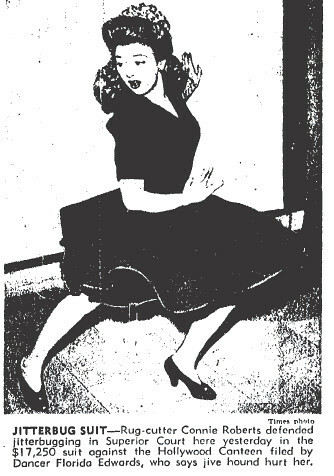 Darla played the neighborhood femme fatale (at four years old!). Here’s Darla stealing the hearts of the local boys. Who can blame them for being smitten. She’s adorable! 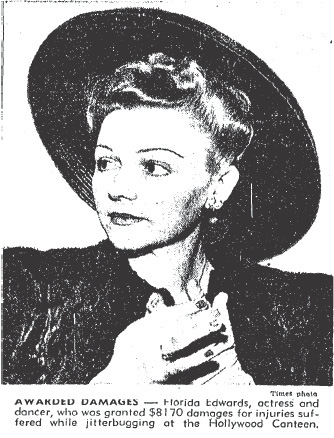 During the divorce hearing Darla revealed that her husband, thirty-threee year old insurance salesman Robert W. Decker, would often arrive home in the wee hours of the morning drunk and with lipstick smeared on his clothing. Darla told Superior Judge Frederick F. Houser that one morning she “…got up and found him in the kitchen washing his shirt.” According to Robert he was trying to remove some red ink that he’d spilled on himself. Darla didn’t buy a word of his lame tale, and told him that she was sick and tired of spending her evenings at home alone. Robert’s response to Darla was that whatever he was doing was none of her business, then he shoved her to the floor. Darla let Judge Houser know that she didn’t want any alimony. She explained that she was accustomed to taking care of herself — all she wanted was to be out of the marriage. Her decree was granted. 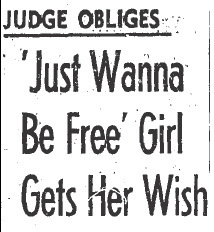 Oh, and the name of the song she was promoting — “Just Wanna Be Free”. Ladies, if you think your man is cheating on you forget the GPS, and don’t hire a private investigator — check his clothes for lipstick smears. If the color on his shirt doesn’t match anything in your cosmetics case, you’ve got a problem. For instance, one of my favorite shades of lipstick is Twig by MAC. If my husband came home with traces of a screaming red lipstick on his collar he’d better be prepared with a darned good story. 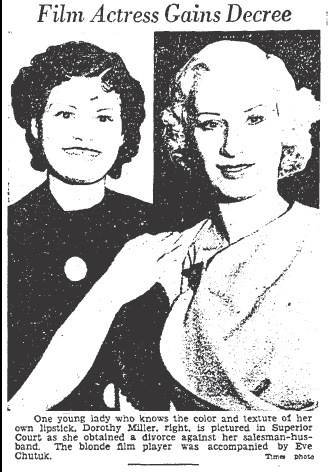 Mrs. Mildred J. Arnold’s husband was tacky enough to entertain his blonde on the side in his wife’s very own boudoir! No wonder she was peeved. Add his infidelity to the occasional beatings he administered to Mildred, and the fact that he frequently went to dances on his own and it’s no wonder Mrs. A. sued for a divorce. 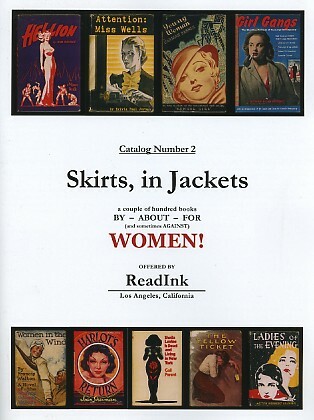 When I’m not writing about women, I’m reading about them; so, I was delighted when I received the latest catalog from ReadInk entitled: “Skirts, in Jackets”. I’ve been poring over it for days now and there is so much to see (and desire). 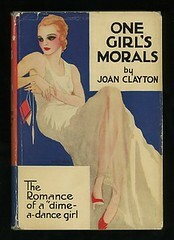 There are books from different eras covering topics ranging from flappers to girl gangs in the 1950s. As a woman who has purchased books strictly for their dust jackets, I’m having a difficult time deciding which of the glorious tomes I want to have grace my nightstand. 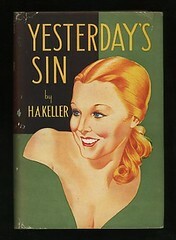 Oh, and the titles are simply amazing — “Ladies of the Evening”, “Women in the Wind”, “Yesterday’s Sin”. You may order a hard copy of the catalog and/or view it online. Don’t wait — these are some restless dames!